Before the premiere of The Farewell on the first full day of Sundance this year, Lulu Wang asked the audience to smile and say “eggplant” for a photo. In China, she explained, people say the Chinese word for “eggplant” rather than “cheese.” Everyone at the Eccles Theater obliged before settling to watch what would become one of the most heralded selections of the festival. And sure enough, during the film, a family -- one modeled on Wang’s own -- says “eggplant” while posing during a wedding banquet. It’s a funny but painful moment, one that’s laden with sorrow, typical of The Farewell. It was immediately clear after seeing Wang’s movie – which stars the comedian Awkwafina – that it was going to be one of my favorites of Sundance, and possibly even one of my favorites of the still very young year. I wasn’t alone. In casual conversation, it was at the top of attendees’ "must-see" lists, and was eventually bought by the distributor A24. Awkwafina plays Billi, an aspiring writer living in New York, struggling to pay her rent. Soon into the running time Billi learns that her beloved grandmother Nai Nai (Zhao Shuzhen) is ill. Billi’s desperate to see her, but there’s a catch: No one in the family has decided to tell the elderly woman about her diagnosis. Billi’s parents (Diana Lin and Tzi Ma) are heading to China to visit Nai Nai -- and to essentially say goodbye -- but under the pretense that Billi’s cousin is getting married. That part isn’t a lie: Hao Hao is getting married, nervously, to a girl he’s been dating for only three months, and Nai Nai is putting all of her energy into throwing him a grand wedding banquet, arguing over lobster versus crab rather than worrying about her health. Billi’s mother Lu Jian doesn’t want her daughter to come, because she believes the young woman is too emotional and will give away the secret. But Billi, despite her limited funds, books a flight. When she arrives in Changchun, she’s immediately at odds with herself. Her instinct is to be overcome with sadness upon losing the demanding woman who lovingly calls her "stupid child," but there's a logic to the charade, which the people around her constantly reiterate. Wang recognizes the inherent morbid humor in the situation, but it’s not a broad comedy (despite the wishes of some of executives to whom Wang initially pitched it). Because, of course, this all happened to Wang. The title card reads "based on a true lie," and she told a more factual version on This American Life. But it was always -- in one fashion or another -- a tale destined for the screen. "Because the event required me to not show emotion, I had to remove myself from being in the experience in order to not just fall apart in front of my grandmother," Wang says. "I was in Berlin at the time working on my first feature film, and I went and got a digital video camera and thought, you know, I’ll just make this into work and that way I can stay removed from it. I was always behind this camera when I got to China. My grandma was like, 'Why are you always filming? Come over and talk to me.'" Thematically, The Farewell is about reconciliation with the past and wrestling with cultural traditions that now seem foreign in a country that once was home. But it’s also simply about grappling with the loss of a loving grandma and everything she represents. And that’s one of the reasons Awkwafina -- a.k.a. Nora Lum -- ended up starring. 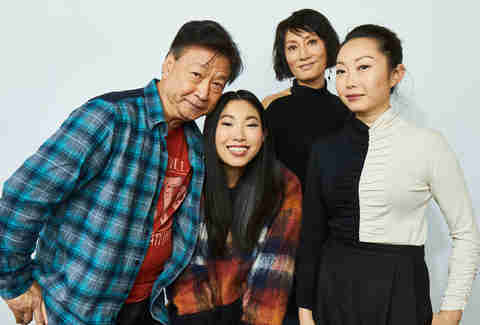 "When Nora and I met she was like, 'Look, everybody knows me as Awkwafina, everybody knows "My Vag," I get that I’m not the obvious choice for this, but I want to tell you about how I was raised by my grandmother when my mother passed away when I was four, and how much this role means to me, how much this story means to me.'" "Comedian known for bit parts takes on a serious lead role" is not an unfamiliar narrative for Sundance. (See: Pete Davidson.) But Awkwafina’s performance here is special, perhaps because it is so lived-in. By necessity it’s masterful in its restraint, but she never loses the charisma that made her a break out star in Crazy Rich Asians and Ocean’s 8 last year. Meanwhile, Wang searched parks in Changchun -- her grandmother’s hometown -- to find someone to play Nai Nai and settled on the Chinese television actress Zhao Shuzhen. Wang’s own great aunt played Nai Nai’s on screen sister Little Nai Nai, the primary person responsible for maintaining the lie. “To this day even when I told her we premiered at Sundance she was like, 'Oh that’s great are you sure my fat face didn’t ruin your movie?'" Wang says. "I was like, 'Stop saying that. Everyone thinks you’re amazing.'" I ask Wang if she’s had the chance to talk to her parents in depth about the film since the premiere. Not really, she says, it’s been a whirlwind of press and parties. Her dad did tell her that he cried "a lot" -- a big admission from him, she says. They’ve mostly talked about where she goes from here. After all, Wang herself became something of an overnight celebrity in the mountains, entering an echelon of newly anointed auteurs. (Think Barry Jenkins or Marielle Heller.) "We have these conversations where I’m like, there are these opportunities where I will now finally maybe be able to do things for you guys, and it’s been so powerful because my mom is like, 'You’ve never made your choices around money and that’s what got you here, and everything is going to be fine, there’s abundance and you do what you think is best for you for your film for your career,'" Wang says. "That’s been so powerful, because it allows them a sense of freedom from fear. That is a gift that I think is greater than anything material."